Almost all children in India are enrolled in school. 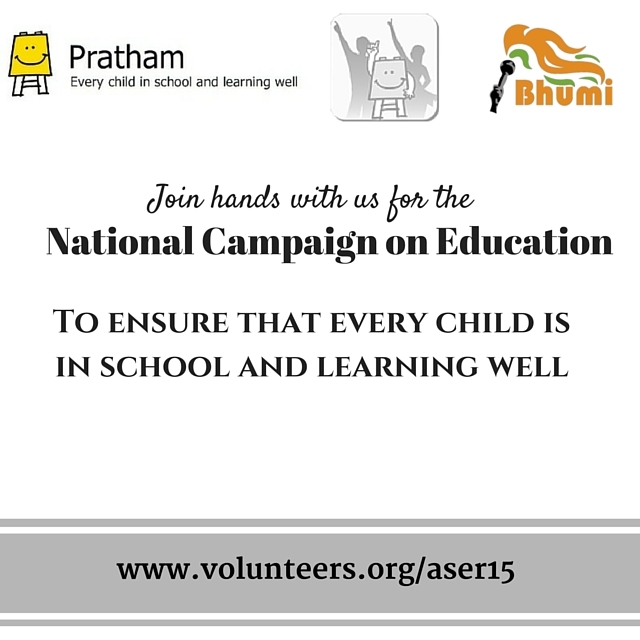 But ten years of data from ASER by Pratham (Annual Status of Education Report) show that there is a major learning crisis in India.The latest ASER figures show that less than 50 per cent of Std V children can read a Std. II level text fluently. Less than 30 per cent of Std V children can solve simple division problems. Other available data also points to the fact that there is high enrollment but low learning. Everyone thinks that since children go to school, they must be learning. But learning is difficult to see. If the problem is not visible, it is difficult to accept it. But once you see the problem then the process of finding solutions can start. Hence this survey where ordinary people like you and me can assess and understand whether children are learning the basics. If children are not learning, there are tried and tested ways to address it quickly. If we know there is a problem and we have a solution, then why wait? We can act now. Look at your own communities, understand how well children can read and do arithmetic, and then ensure that all children can do at least the basics.